(Gene Dogs#1(fb1+2) - The original Gene Dogs (Howitzer, Kestrel, Pacer, Panther, and Tyr) were initially part of Team Omega, an elite counter-terrorist squad serving under Lars Dinkelbach. On a mission in the Congo, the group was ambushed by an unidentified creature and severely injured. 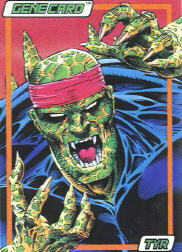 Dinkelbach escaped relatively unscathed and brought the Team back to STORM Central, but the creature carried an artificial virus which prevented their wounds from healing. In order to save their lives, Dr. Samuel Merrick mutated them using his Gene Matching Device. They were each gene-spliced with different animals to gain different abilities. They also received Gene-Chips, bio-wetware computer chips planted in the cerebral cortex to further enhance their abilities. The transformation destabilized their own genetic structures, so that they required regular treatments from Merrick to survive. 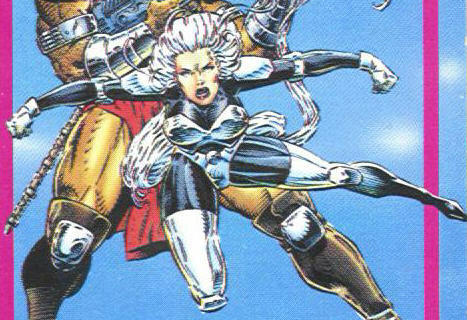 The group serves the secret government organization, STORM, acting as their field operatives. (Gene Dogs#1-4) - One year after their mutation they were sent to retrieve the Gene Scanner, a piece of technology that Otomo was trying to steal from the organization Mys-Tech. Otomo sent his agents the Q7 Strike Force to obtain the Scanner. The Gene Dogs fought off the Strike Force and obtained the Scanner, but in the process, Panther was slain by Banzai. STORM sent Cat to replace Panther temporarily. Mys-Tech had created the Gene Scanner, which was actually a bomb, but leaked word of its incredible mutagenic abilities to dupe Otomo into stealing it. 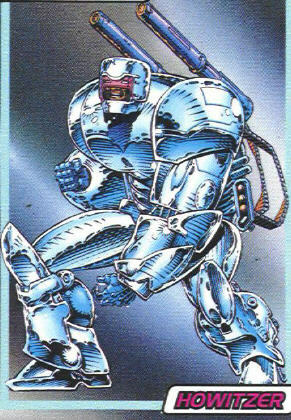 Mys-Tech used Hurricane to retrieve the Scanner from, and then leaked word to the Strike Force, who ambushed him and captured both him and it. The Gene Dogs eventually teamed-up with the Strike Force to destroy the Scanner after learning it was a bomb. In the process, they learned that Panther had secretly been a Mys-Tech agent, and they battled the group Genetix while following a false lead of Panther's. Otomo and the Strike Force escaped, and Hurricane was reimprisoned. (Genetix#3, 4) - The Gene Dogs again encountered and fought against the group Genetix when Genetix stumbled into STORM Central while pursuing the group Tektos. After another pointless battle, Vesper tapped into STORM's computer system and communicated with Eagle and Merrick. After some explanation, the two contacted Cat and had her stop the fight. Despite the fact that both groups now know they work for the same side, they maintain some degree of antagonism towards each other. COMMENTS: Created by John Freeman and David Taylor. 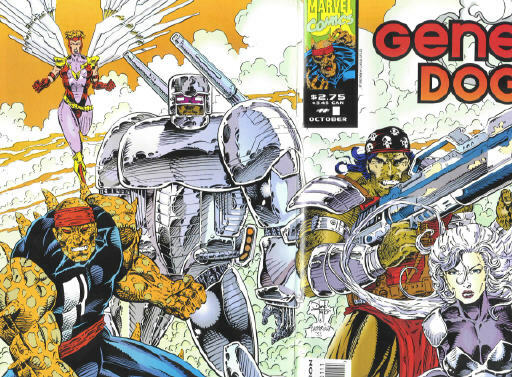 The Gene Dogs were created as part of the Marvel UK imprint, and haven't been seen outside of it or since it stopped production. Can anyone tell me what the status of all these characters are? These characters all were featured on cards as part of the "Gene Card" series. Panther's last name was revealed in Marvel Atlas#1. 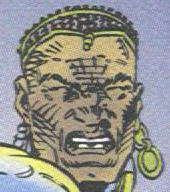 Howitzer's heritage was revealed in Marvel Atlas#2. Tyr takes his name after Tyr, the Asgardian God of War, @ Journey into Mystery I#85. Otherwise, he has no direct connection to him. Tyr of the Burning Blade, of the World of 1000 Galaxies, @ Thor Annual#2. (Emma Malone) - Her origins uncertain, she may or may not have been mutated by the Gene Matching Process. 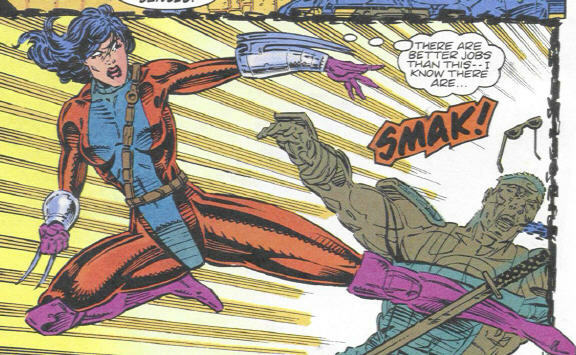 She was a former member of a STORM Assault Squad, she was drafted into the Gene Dogs to replace Panther and learn who the traitor in their midst was. She was initially resented by most of the members, especially Tyr, but soon proved her value both in combat and as team leader. 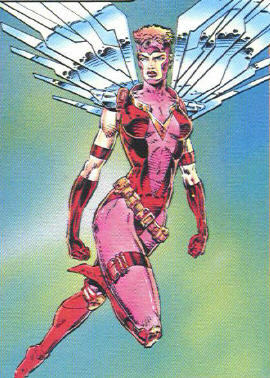 In addition to advanced training in many forms of armed an unarmed combat, she possesses limited telepathic abilities. She can read the minds of most beings (Tyr could resist her when he was angered). She also could link the minds of a group to better coordinate their attacks. She is joined in Gene Dogs#1. She's in a flashback in issue 2, which precedes that issue. (Shaka) - A native of the African country Mbangawi, he was gene-spliced with a large marine mammal, he serves as a calming influence on his teammates. He sees balance in all things and lives by his own code of honor and justice. He has a past relationship with Tanuta, of Q7. Howitzer is forced to wear a large suit of armor to survive as his body cannot maintain its own temperature. He has large lungs and an extended life span.. He possesses superhuman strength (Class 25) and durability. He carries large guns on his back, which he can control cybernetically. (Annie Jones) - raised in Manchester, she is a teenage computer prodigy. She can generate crystalline wings with which she can fly, or use as a sharp weapon. She is headstrong, but very intelligent, streetwise. She is both carefree and a real team player. (Carlos deSilva)-serves as team leader along with Cat. He was gene-spliced with an unnamed "ferocious" creature. He possesses superhuman strength (enhanced human), stamina, and tracking abilities. His natural fighting skills have been enhanced by gene-chips. He is terse and straightforward. (Corine Walton) - The traitor in their midst, she was a double agent for Mys-Tech. She was the lover of Tyr. It was her false lead which sent the Gene Dogs into conflict with Genetix. She was skewered by Banzai during the struggle for the Gene Scanner. She possessed heightened senses and great skill in unarmed combat. She used twin spikes on gauntlets on her wrists. (Marc Devlin)- He has a history in the military and saw a lot of service before joining STORM. He was gene-spliced with a dinosaur. He was the former lover of Panther, and he resented Cat coming in to replace her, especially when she incriminated Panther as the traitor. He possesses superhuman strength (Class 10) and durability. He is a savage warior, as well as being hot-headed, stubborn, and unforgiving.